Stereotypical neighbors from hell #infographic ~ Visualistan '+g+"
You think you've finally found the perfect house in the perfect town. You move in, the excitement is uncontainable, and you think everything will be great. That is... until you meet your neighbour. People from all walks of life can end up living next door, most of which are kind and wonderful people. Unfortunately, there always seems to be that one inconsiderate neighbour that doesn't realise, or seem to care, that they're the neighbour from hell. 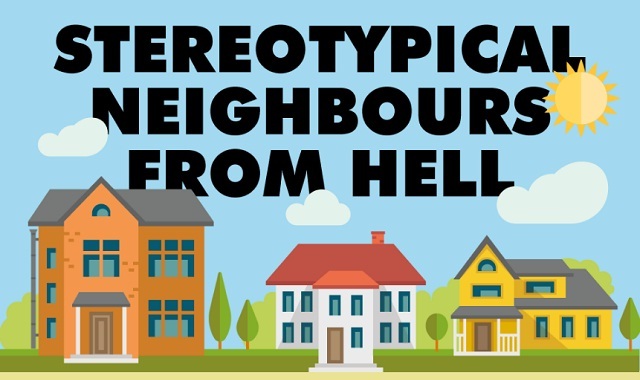 Below we've listed a number of the most stereotypical neighbours from hell.